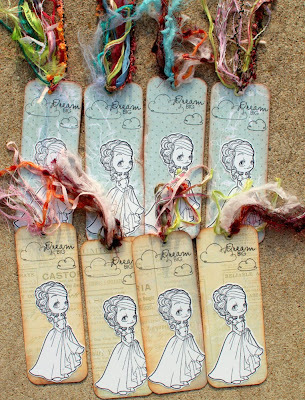 What a bunch of scrap...: Some Odd Bookmarks! I have a fun and quick Some Odd Girl project to share today - it's a great way to make your kids happy and use up LOTS of scraps at the same time! I decided to make bookmarks. For this, I recommend nice and thick, double-sided paper. I used Prima "Romantique". Prima paper is thick and has pretty patterns on both sides, so it was perfect for this project. I was able to use up some scraps from this older collection. I then added large brads in the top, and put lots of pretty old Basic Grey fibers for decoration. Using fibers is a great way to use up that old stash I know you still have! I used the stamp set "Royal" from Some Odd Girl and colored her with Copics. 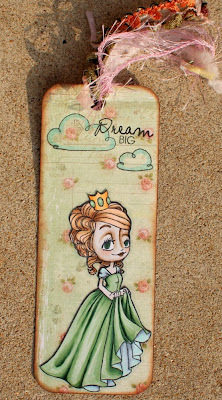 For the clouds and the words "Dream Big", I used the "Grow" stamp set from Some Odd Girl. The 8 plain bookmarks are perfect for my daughter to gift to her friends, for all of them to color themselves. I stamped the image on Bristol Smooth paper, which is perfect for them to color up with pencils. And the pretty bookmark I colored makes a great teacher appreciation gift (my daughter is having teacher appreciation week this week at school). Let me just say that I scored big time, in my daughter's eyes, with this project. I believe her exact words were, "I'm very proud of my mommy" :) So if you have scraps of paper and old fibers cluttering up your space, this is the way to go! Let's face it - bookmarks are fun to make, but at this point, most adults have e-readers. Awesome Ilene, these are really cute. Great idea for the kid's to color their own. Are you going to pin these? May I? KathyR. Oh your book mark looks amazing.. the coloring is superb! and so much fun for your DD and her friends too! Wow! These are gorgeous Ilene! What a great idea!